Most modern furniture strives to be seamless. Whenever I see cool tables in cafes, restaurants or showrooms, and I often have to stick my head under the tabletop to see how they're joined together. Then there's Joe Doucet's WL01 "ScrewTop" table, which wears its joinery method on its sleeve, so to speak. 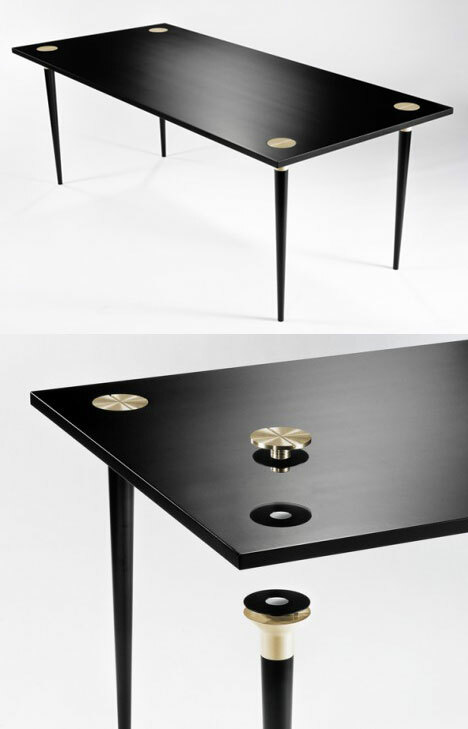 The flatpack table comes together by means of massive screws that sit flush with the tabletop; it sounds like it would look cheap, but comes across as elegant. "WL01 ScrewTop proudly displays its construction as a design feature, takes the idea of self-assembly and elevates it to a fetish," says the description on Doucet's site. Check out more of his stuff here.